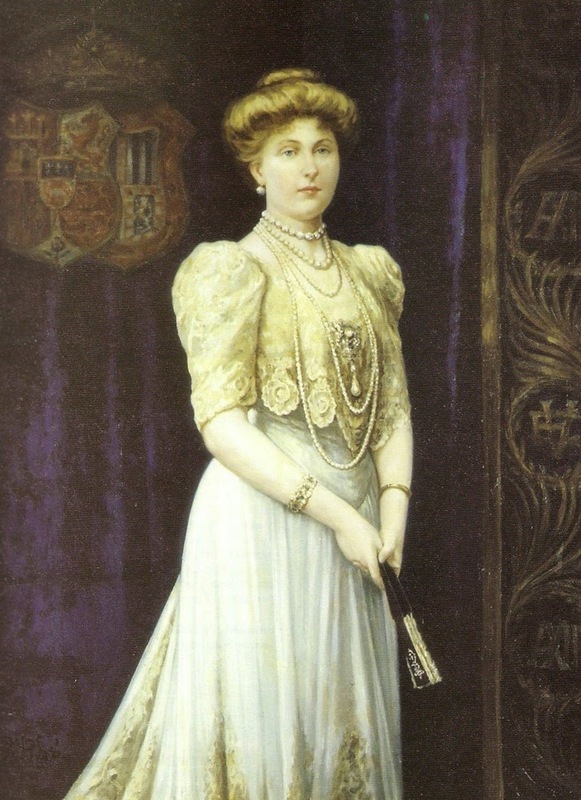 When our Magpie of the Month, Victoria Eugenie of Battenberg, married King Alfonso XIII of Spain, she immediately became the nation's queen consort. 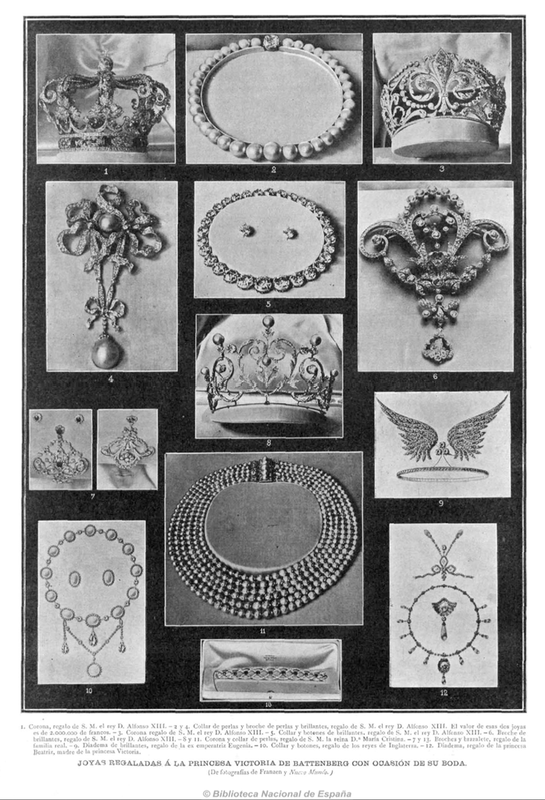 As you can probably imagine, that kind of royal wedding, where a bride transforms into a queen, requires major jewelry. Let's have a look at the jewels that Ena wore on her wedding day, shall we? 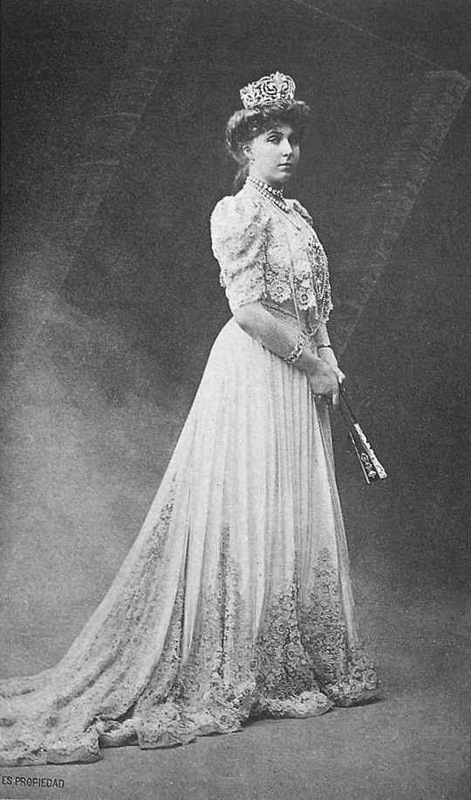 Ena's wedding day -- 31 May 1906 -- was not exactly the perfect royal wedding. Her mother-in-law was reticent about the marriage and some of the Spanish people were apparently skeptical of their new British-born queen. 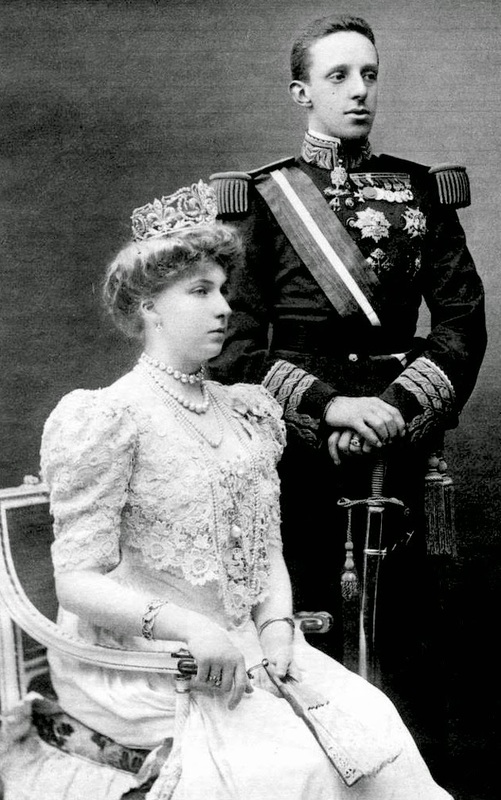 But worst of all, Alfonso and Ena were nearly assassinated as their carriage drove them through the streets of Madrid after their wedding. An anarchist threw a bomb at the couple as they headed back to the palace; a number of people were killed, but Ena and Alfonso escasped physically unscathed. Only Ena's bridal gown was worse for wear, as it was stained with the blood of an injured guard who was positioned near her. Much of the rest of Ena's jewelry in these portraits is also from her collection of wedding gifts, many of them from Alfonso. He gave her the diamond earrings she wears, plus her diamond collet necklace (the top one) and the large single strand of pearls (the second one). Ena also wears several long pearl necklaces -- one of her trademarks. And on the front of her bodice, you can see a diamond brooch pinned to the lace. A large pearl drop is attached to the brooch; this is the copy of the famous "La Peregrina" pearl. The brooch was also a gift from Alfonso. She also wears a ring on her right hand. Ena wears two bracelets here: a simple pair of bangles on her left arm, and then a more elaborate bracelet on her right. That bracelet was also a wedding gift; the illustrated list of the jewels she was given notes that it was a gift from "la familia real," presumably the Spanish royal family. You can see the list here (with captions in Spanish below); Ena is wearing items 2, 3, 4, 5, and 13.